- Living with a weakened immune system or a chronic medical condition (like diabetes, heart disease or lung disease). If you have a severe egg allergy or are sick the day of the clinic, check with your doctor before getting vaccinated. Call your regular health care provider to see what other shots you may need. If you don't have a regular provider, call 2-1-1 (LA County Information Line) or visit www.publichealth.lacounty.gov/ip for a list of no cost or low-cost vaccine providers. Clinic dates and times are subject to change. Please call to confirm before you go. 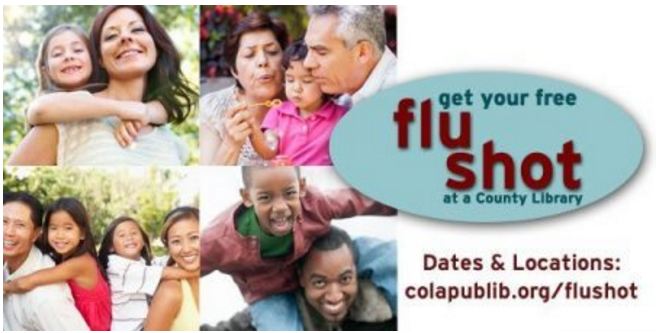 The LA County Department of Public Health has partnered with the County of LA Public Library to provide flu vaccines at no charge to people who don't have health insurance or whose healthcare provider doesn't offer flu vaccines.